as ye see ME+ have. The LORD JESUS appeared in His+ glorified Body to the Company of His+ Disciples. 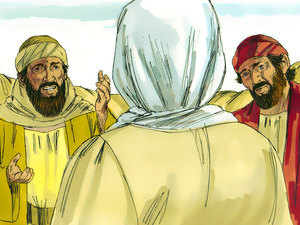 Although Followers of JESUS, these men — every one of them His+ disciples — were not with Peter nor with the Women of the Company nor with the men walking to Emmaus and thus, they had missed seeing the Resurrected LORD JESUS. The Company of His+ Followers did not believe ANY reports of their fellow Followers ! They did not believe that The LORD JESUS CHRIST was risen from the dead ! They did Not Receive their Witness. They had watched HIM+ die, themselves being scared to death. They were gathered together in Jerusalem somewhere, when SUDDENLY HE+ APPEARED among them. ” Peace unto you !” HE+ said. Did that bring them “peace” ? NO… because they did not receive His+ Words . They were terrified and frightened. They thought they had SEEN a SPIRIT ! So, HE+ told them to observe His+ hands and His+ feet … undoubtedly as a means to identify HIMSELF+, that it was indeed HE+ HIMSELF+ , to these terrified disciples who had watched HIM+ die. in His+ Glorified Body . Then HE+ showed them His+ hands and His+ feet. YET they BELIEVED NOT for joy, and wondered ! Then, HE+ ate before them. Undoubtedly, every eye was trained upon His+ biting, chewing, and swallowing! ALL things written of HIM+ in the Prophets and the Law of Moses and the Psalms concerning HIMSELF+ had to be fulfilled , HE+ explained to them. help me to remember that my heart must be open to the Truth before I can understand it with my mind. Help me to minister Thy Word+ to others in a way that their hearts are pierced. Then I will know that YOU+, O LORD, will open their understanding of it. Keep me from teaching to the mind when I ought to be reaching the heart . O LORD JESUS, Master of men’s hearts, show me how to so bring my life in line with Thy+ Truth… that without a word spoken, others will see YOU+ , standing among them. Blessing and Honor, Glory and Power be unto The LAMB+ forever and ever ! Amen. Preach the GOSPEL always; if necessary, use words. Thank you, brother Donald John. I appreciate your response.